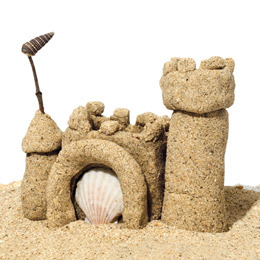 Turn sand from your next beach vacation into this easy-to-use clay, then build a permanent, air-hardened sand castle for a keepsake. Add the water and stir the mixture until it is smooth and the cornstarch is dissolved. Cook the clay over medium-low heat, stirring occasionally. The clay should start to thicken within a minute or two. Stir more vigorously, being sure to scrape the mixture from the sides and bottom of the pan.